A cancer diagnosis can be overwhelming, especially when you prepare for treatment with your care team. However, knowing what to prepare for can help make the process a little easier. Here’s what you can generally expect in your first meeting with your oncologist, and care team, after your diagnosis. Before you meet with your oncologist, who is usually matched with you based on your cancer type, your introduction to the team will likely come in the form of a phone call from a patient coordinator. They’ll look to gather your medical history and compile it into a single, complete file. This file will also include information regarding any scans or previous tests you’ve had, which your care team will collect for you. All of this information will help your oncologist research your unique case and come up with a treatment plan that works for you. Prior to meeting your doctor, you may also be asked to enroll in a clinical database or biobank, a database of tumor samples. Researchers use this information to improve treatment options for patients. When it’s time to meet with your oncologist for the first time, they will usually have you walk them through your story. This serves two purposes: first, it allows them to confirm the information collected by the patient coordinator and fill in any gaps. Secondly, it gives them an opportunity to get to you know you better. As a result of this conversation, they’ll be able to learn more about your hopes, concerns, and goals, and can work to create a treatment plan that is best for you. In telling your story, it’s important to never withhold information. Try to be as complete as you can be, and when in doubt, err on the side of oversharing. The more information you provide, the better aligned you’ll be with your team. Don’t worry if you get stuck; your doctor will have your medical chart, and they can use it to help guide you through each milestone. In addition, you may find it beneficial to have someone accompany you during your initial visit. Not only can they provide emotional support, but they can also take notes, help you remember important dates, and process things after the visit. “These conversations are always helpful and absolutely essential. 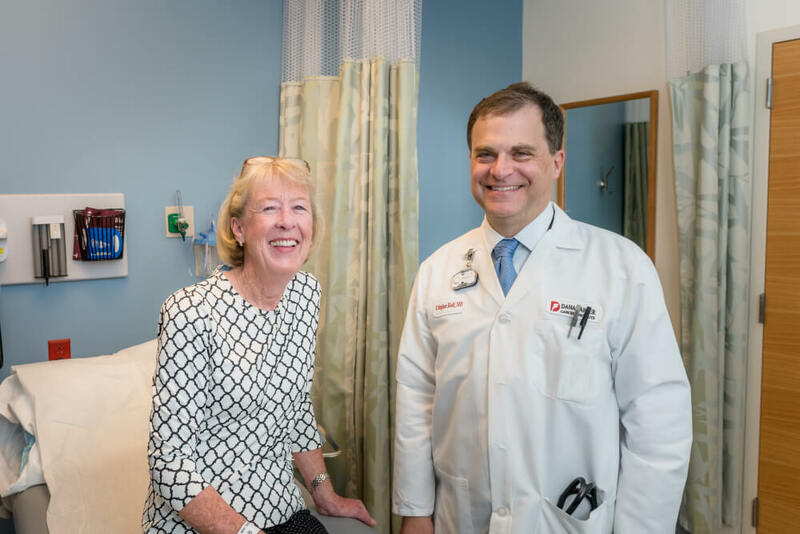 By hearing my patient’s perspective, I’m able to get a sense of how to best meet their needs and help them reach their goals,” says Mark Pomerantz, MD, an oncologist at Dana-Farber. In most cases, your introductory appointment will usually include a short physical exam conducted by your oncologist. Open communication with your oncologist is essential to cancer care. Once all of your information is collected, your oncologist will want to make sure you understand your cancer. They will usually start by explaining the general characteristics of your type of cancer, and then talk to you about your particular diagnosis. For example, if you have intermediate-risk prostate cancer, they may begin by explaining prostate cancer before diving into the different types, and finally, explaining your particular diagnosis. At this point, you’ll start to learn about the various treatment options available to you, and the accompanying percentage of success for each. It’s important to remember that not all cancers are the same, and your diagnosis may fall into a “gray zone.” Factors like the cancer’s location, its stage, or even your age make it more difficult to accurately calculate how you and your cancer will respond to each treatment. Every treatment has its pros and cons, and your doctor will make sure you know what these are. However, they should also make you confident that they’ve created the best possible treatment regimen for you. Once you understand your condition, it’s time to nail down a plan. This includes scheduling your therapy, which typically occurs within the week; in rare cases, you could begin treatment on the same day you meet your oncologist. They will also use this time to cover what the next few months of management will look like. Don’t be surprised if the place where you receive your therapy is different from where you had your consultation. It could take place at the same hospital, or you may be advised to undergo care locally if your oncologist thinks you can get the same care closer to home. In this case, your oncologist will be in regular contact with your local care team, and they will be available any time you have a question or a decision to make regarding your care. If possible, patients should try to come to their appointment with someone they trust. This experience can be difficult and anxiety-provoking. Having someone there to comfort you or take notes can be helpful. Secondly, make sure you have something to write with. Your oncologist will be going over a lot of information and writing things down will help you sort through these details later on. Some hospitals may allow you to even record these conversations. Just make sure you have your doctor’s consent before doing so. Finally, don’t be afraid to seek a second opinion. This can be exceptionally valuable if your diagnosis falls into the “gray zone,” and your oncologist may even be able to help facilitate a meeting with another doctor.